Washing the face twice or thrice a day is enough. Do not over-do it. Try to use oil-free skin care products for they are irritant-free. Even oily skin needs moisture- use a light and oil-free moisturiser. The cleaning of skin must be done with a sponge cloth in a circular motion. Keeping a radiant skin and maintaining a youthful appearance becomes difficult with oily skin. The unwanted shine on your face can’t be washed or cleansed in this case. The excessive secretion of sebum (natural oil) often results in a shiny and oily skin, causing acne and pimples. Apart from this, there are several other genetics and hormonal changes that occur during the different stages of our life affecting our complexion. 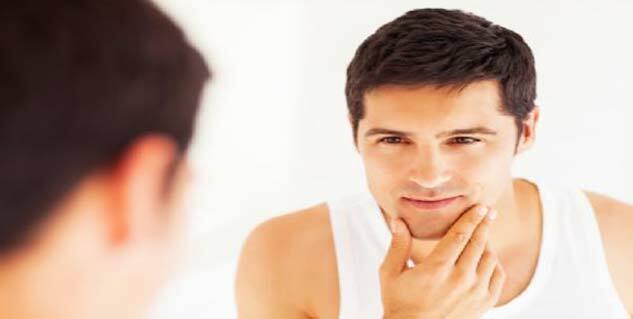 Like women, men also face a stiff challenge to cope up with oily and shiny skin. Listed below are some of the beauty tips to care men’s oily skin and keep it looking youthful. Oily skin is not a hygiene affair that will get better with washing. Washing your face more often won’t help, and can even get worse. To be on the safe side, use products that contain glycerine or salicylic acid, which can help to keep the pores clear. Oil is the last thing your skin need as it is already laden with extra oil. Try to use oil-free skin-care products and cosmetics to the extent possible. In case you are using oil products, ensure that these are non-irritating and fragrance-free. Try to ensure that the beauty product which you are using suits your skin type. Look at product label before buying. Choose from a skincare line you know is compatible with your skin or the one recommended by the dermatologist. All skin types need certain amount of moisture, but you have to be extra careful if your skin is oily. Use a light and oil-free moisturiser. Before you apply moisturising lotion, pat dry your skin to ensure that the pores are not clogged. Similarly, if you are wearing a sunscreen, make sure it is oil-free and has sun protection factor (SPF) of 15 or higher. You must remove dead skin and excess oils with the help of a skin cleanser that contains slightly abrasive ingredients. The cleaning of skin must be done with a sponge cloth in a circular motion, and thereafter washed off with cool water. Alternatively, you can use a clay-based facial mask to help remove excess oil and invigorate the skin. Creams containing retinol or retin-A works well for acne and excessive oily skin but it may cause drying of the skin, sun sensitivity and other reactions. So, consult a dermatologist before using retinoid on your skin. Revitalise your skin by trying the aforementioned tips and make your personality to shine.